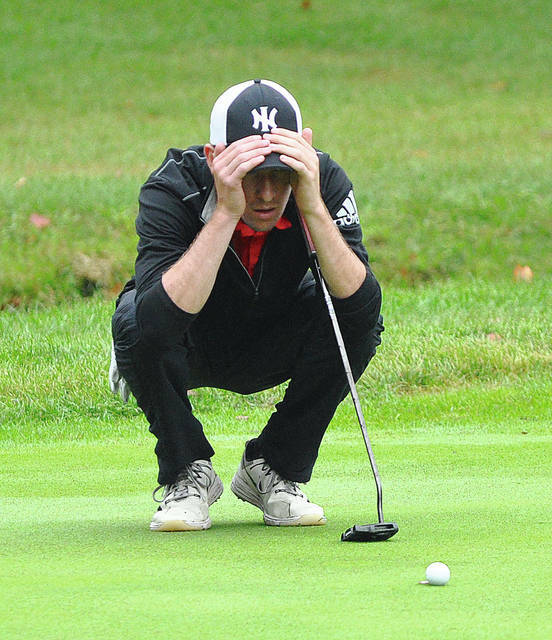 Rob Kiser|Call File Photo Chet Jamison looks over a birdie putt at the sectional tournament last week. BEAVERCREEK — Everything came full circle for Newton golf coach Randall Jamison and the Newton boys golf team at the D-III district tournament at Beavercreek Golf Club Thursday. And he couldn’t have drawn it up any better than the way it played out. If you are going to do something special, make it really special — and the Indians did just that, becoming the first Newton boys golf team to qualify for state, and doing it by rallying from seven shots down over the final nine holes to win the district title by one shot. Newton finished with a 343 total, one better than Fort Loramie. And while Newton senior Chet Jamison was medalist with a 73, it was Nate Zielinski who recorded the shot of the day. Zielinski was in a deep greenside bunker on 18 — and got up and down for par to help preserve a one-shot victory. There was plenty of special in Chet Jamison’s back nine as well. After going out with a 40 on the front nine, he came in with a three-under par 33 on the back nine. And he heard about Zielinski’s amazing shot. The rest of Newton’s scores were Garrett Peters 87, Ross Ferrell 91, Nate Zielinksi 92 and Kleyson Wehrley 96 — allowing the Indians to make some history — which was all that mattered to Chet Jamison. He has talked about it from the start of the season. And, while Randall Jamison had similar feelings — there was also some emotion watching his son take medalist honors. And for Randall Jamison this moment was even more special for a reason. Who made school history in the most special way possible — and made sure the coach will have a fitting and memorable finish to his time at Newton. https://www.dailycall.com/wp-content/uploads/sites/30/2018/10/web1_chet1.jpgRob Kiser|Call File Photo Chet Jamison looks over a birdie putt at the sectional tournament last week.